Ya'll. It is exactly 20 days until the greatest day of the year: Thanksgiving! That seems like a lot of time, but it's not. I've already started planning! I love Thanksgiving like other people love Christmas. In my family, Thanksgiving has always been a huge deal. Growing up, we would go to my Cousin Alice's house, pack 30 or so people into a 1,500 square foot house and chow down on some of the best food I have ever eaten. Family members would come all the way from Virginia and Alabama to North Carolina. We'd have shrimp cocktail, turkey, mashed potatoes, gravy, seven-up salad, yams, green bean casserole, sweet potato casserole and at least five different pies. And deviled eggs. Lord, the deviled eggs! I'm having a moment here, sorry. When my Cousin Alice passed away, we started driving down to Georgia to have Thanksgiving with my mom's sister's family. She had an amazing kitchen and we would have five women in there all prepping food at one time. Now, Thanksgiving is at our house. We started hosting it when we lived in our two-bedroom apartment. My parents, Aaron's parents, his sister and her husband all come over and we have Thanksgiving together. It's truly my favorite day of the year. All the food, all the family, all of the love and none of the drama of Christmas! Our first Thanksgiving with both of our families! We used two card tables and had to use candle holders to even the height of the tables! First Thanksgiving in our new house! With my beautiful table! 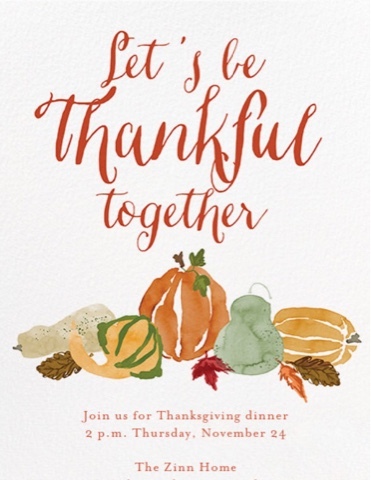 This will be our third year hosting Thanksgiving with both families. We're fortunate that there aren't a ton of us and that our families live close and like each other! I love that we don't have to do two Thanksgivings, but that everyone is together at one time. But this isn't something that just happens over night! Here's what I have learned from my years of being an avid Thanksgiving participant and, now, host! You have got to start planning for this junk at least a month in advance. I'm not talking all day, every day planning, but you do have to think about it. I send out a Paperless Post invite about a month in advance of the day. I send it out to our families to let them know that we're hosting it again, just in case someone thinks they are going to dethrone me. Ha! About two weeks out, I send an email to the families letting everyone know they have a week to let me know the side and dessert they are going to make. This way, no one does duplicate meals. It also gives me a chance to do my grocery shopping and grab anything necessary that might not have been claimed, like cranberry sauce. I buy my bird about two weeks out. You don't want to get caught trying to find the bird you want two days before Thanksgiving! I use Paperless Post for our evites! For a couple of years, my family did small Thanksgivings. I'm an only child, so it would just be the three of us or it might include one of my grandparents when they were still with us. My mom would make everyone's favorite and we would end up with food for at least two weeks! It was also a ton of work on her. When I started hosting, I had a tiny kitchen in my apartment. There was no way I could do everything! So I decided to do the bird, mashed potatoes and gravy, deviled eggs and a dessert. Each family brings a side and dessert and one family gets to count the cranberry, stuffing and rolls as either a side or dessert. This way, everyone brings their favorite dish, everyone is involved and none of are exhausted that day. Some of the food spread from last year! 3. Be the Thanksgiving Nazi. Do not say "bring what you want." A well planned party and menu means a good party and menu. With my family, everyone pretty much brings about the same thing each year. Thanksgiving is not the time to start trying out new foods, people! But I've known others that just let people bring what they want to Thanksgiving and then you end up with duplicates and missing favorites. While you might seem like a Nazi, if you tell people what to bring or what is expected, everyone is happier. Even if you are doing a potluck, like we do, you need a timeline. This keeps you from losing your mind. Since I'm the host, my timeline starts the minute I send out the invite. Up until the day of, it's a daily timeline. No need to be crazy yet. The day of? That's by the hour. The night before Thanksgiving, I do what I can. I peel the potatoes for the mashed potatoes and make pies. I also look at my menu and make my detailed timeline for the next day. This includes when to start heating the oven, when the bird goes in, when it's supposed to come out, when the rolls go in, and the temps and cooking time for each item. This means I don't have to hunt a cookbook for every little thing. When Thanksgiving Day hits, I'm a woman on a mission! I'm a hostess and a cook. I love for things to be just right. But Thanksgiving isn't about everything being just right. It's about being together! Doing whatever it is that makes your family happy. Don't get freaked out if things don't go right. You can be a Nazi and plan everything and something will still go wrong (ie - my turkey never takes the amount of time it's supposed to!). Enjoy your family and whoever else is spending the day with you. Love them. That's what makes this day so special! I'm hosting this year for the first time in about 20 years!!! I'm excited, as this will be my first Thanksgiving I'm hosting as a single mom in my new house that's just me and my boys! So we are hoping the gathering will help warm the home in many ways! With that being said...I'm ALWAYS the Nazi regardless of who the host is, which is usually my mother. I call my sister and she and I make all the plans then we let Mom know what she's in charge of. It always works out every time and there's STILL food for days and days and I wouldn't have it any other way! This year we have a total of 16 people! I'll be lining up card tables end to end to make one giant banquet table. Quick Question though, as this is something we ALWAYS think about. Do you set all the dishes out like a buffet on the counter/island etc or do you put the main dish and all side dishes on the dinner table? We usually have desserts and drinks in a separate area but the food is always on the table. This year though, the table might not be big enough :( Thoughts? Suggestions? I do kind of a combination. We do a buffet for the main stuff (turkey, sides, etc), but put the rolls, cranberry, gravy and deviled eggs on the table. I have a big kitchen in this house, so I use the bar top for the buffet and our island for the desserts and drinks. Good luck on your 1st Thanksgiving in your new home! !